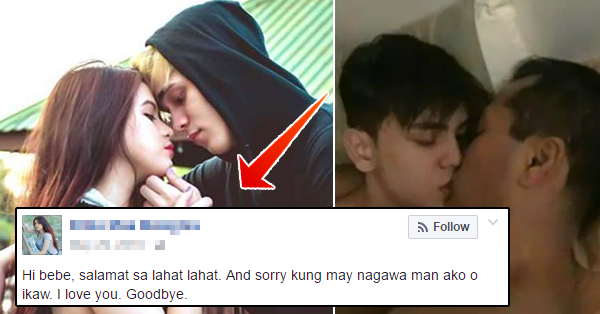 SHOCKING: This Girl Made A Video for Her Boyfriend Which Made the Netizens Shocked! Two of the best and most admired faces on Facebook catch the Netizens' attention and are now getting viral. Lovers Erika Mae Balagtas and Mark Aaron Hernandez seems to be a perfect couple because not only both of them are good looking but also very open to their followers when it comes to their love with each other. Many girls are getting jealous to Erika because of Mark's sweetness to her. In addition, the guy is not ashamed to buy feminine items like pantiliner and undergarments every time she needs those. Just like other girls who used collective photos that a partner has, she created a slideshow of photos showing most the couple's sweet and crazy moments. However, included in the said slideshow was a caption expressing her thanks, apologies and goodbye to Mark. Sounds ironic, right? It was not that everyone expected. The slideshow was made for a different purpose, not on how it was shown at the beginning and in the middle of it, but everyone who watched was surprised at the end part... That was why she added in the caption "Watch till the end." Erika has made some sort of 'sweet revenge' against Mark who made her so in love and dependent on him. It seemed that at times that they were together, she discovered things to the guy that made her hurt so much, which is the very visible reason of creating the slide. The end part is definitely unanticipated. After it showed the line "The hardest part is...", a photo of her boyfriend kissing another man was revealed. Until now, the video is still getting better and bad reactions from the viewers. In a separate post by Erika, she stated that she lost her hope in saving their relationship since Mark does not love him anymore. Aside from gender issues, Mark has also affairs with other girls, according to her. When someone is hurt, especially in love, he or she may do bad things unexpectedly because the feeling is uncontrollable. We cannot blame Erika for what she did. Let us be reminded, as always, that we cannot bring back on what we did in the past since it happened already. If you think that it is the right way, go on. But take into consideration of the consequences for every decision made. You may post a comment/s below for your insights with regards to it.